Highway 395 stretches for 1,370 miles – from the Canadian border in Washington, down through Oregon, California, Nevada and back into California, where it ends just about 150 miles short of the Mexican border. . I drove 730 miles of it heading south last month, beginning in Pendleton, Oregon, and ending when I turned west onto Highway 120 that would take me up and over 9,943-foot Tioga Pass through the Sierra Nevada Mountains and down into Yosemite Valley. Much of the drive was on steep, narrow, winding roads with little traffic. I loved every moment of the journey. 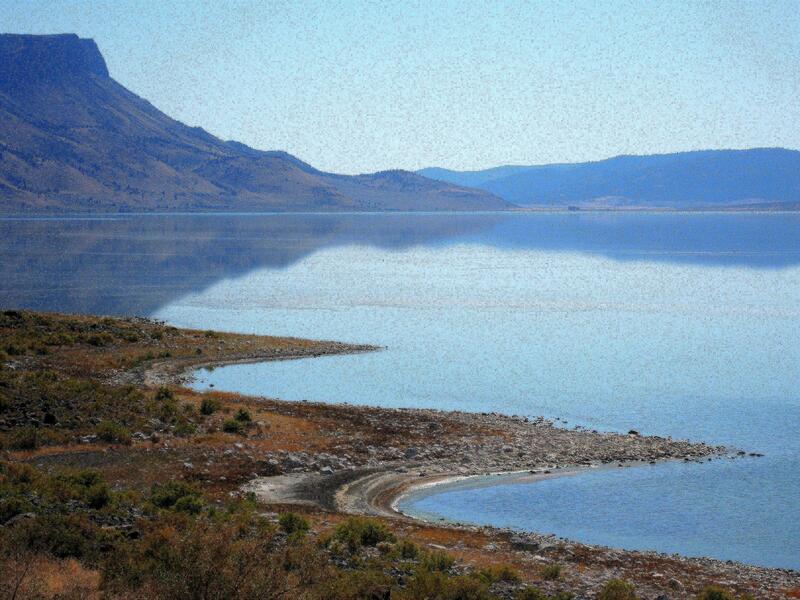 The route winds through Oregon’s Battle Mountain State Park, the Umatilla, Malheur, Modoc, Toiyabe and Inyo national forests, and the X L Ranch Indian Reservation, passing numerous lakes on the way. There’s Goose Lake in Oregon, located near Fandango Pass that was used by early settlers to California; Nevada’s Washoe Lake, located between Reno and Carson City and popular with windsurfers; and Mono Lake in California, which was on my bucket list because of its importance to migrating shore birds. A smaller lake that captured my attention was Oregon’s Lake Albert. Like Mono, it is too salty for fish to live in its waters. It has, however, a dense population of brine shrimp that make it a popular dining stopover for migrating grebes, phalaropes, terns, avocets, geese, stilts, ibis and other birds. Canada geese were the main occupants on the narrow lake the day I drove the 15-mile section of Highway 395 that overlooks the east side of the lake from just feet away. I stopped several times to admire the lonely and lovely view of pink hills reflecting onto the water from the opposite shore. I also found myself fascinated by the geology marker that explained the lava ridge running parallel to the lake. 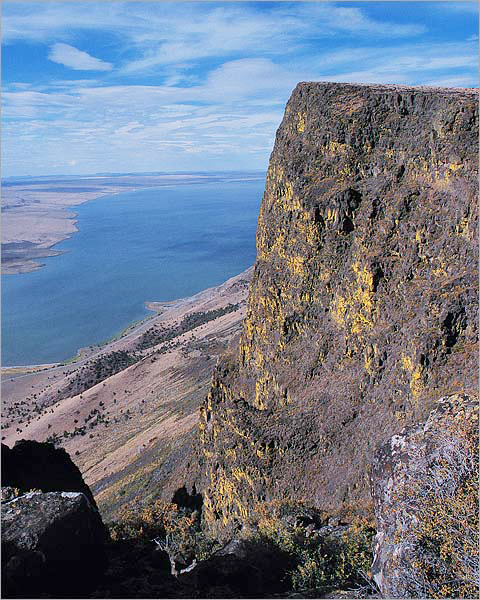 Known as the Albert Rim, it’s one of the highest fault scarps in the United States. 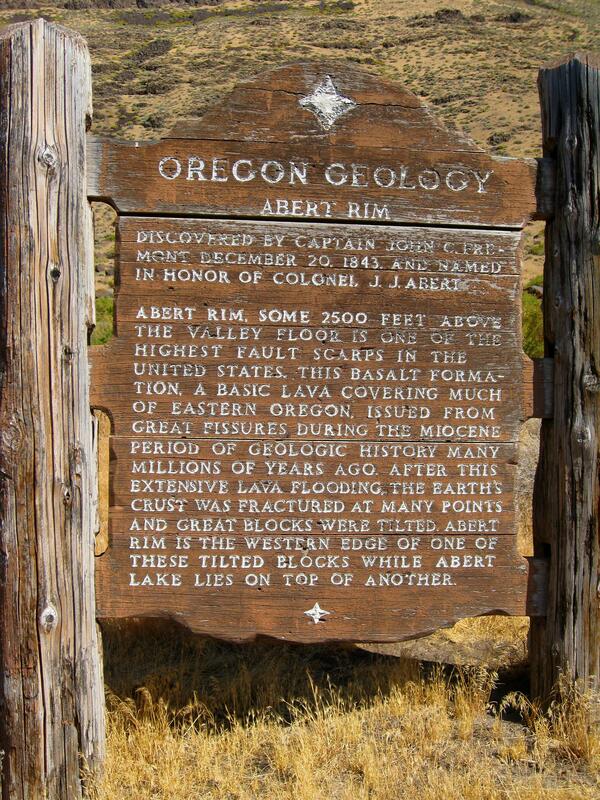 Except for the highway, which ran between the basalt ridge and the lake, and an occasional passing vehicle, I suspected the landscape still looked pretty much as it did during John Fremont’s mapping expedition in central and southern Oregon back in the 1840s. It’s rare to find a place so little impacted by we humans – and wonderful. Love these pictures and the geology lesson. I’m a big rock hound. Started reading “The Big Year” yesterday and am really enjoying it. Thanks for the lead to a good book and your interesting blog. Thanks. Glad you’re enjoying the book. I’ve been telling everyone I know to read “The Big Year.” Especially if they want to know more about what makes us crazy birders tick. You make me want to hop in my RV and go back the the west coast right now. So much beauty out there! I find beauty everywhere I go, but my heart belongs to the West and the Mountains, although my roots still grow in Texas. I Hope you get to travel west soon.